We're stepping into better Health. If you knew that there are several simple steps you can take to reduce your risk of falling, would you do it? Falls are painful, but they are preventable. 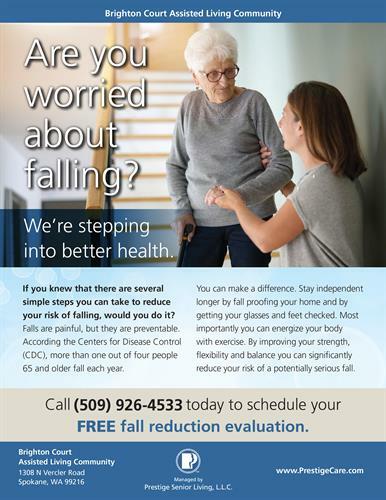 According to the Center for Disease Control (CDC), more than one out of four people 65 and older fall each year. You can make a difference. Stay independent longer by fall proofing your home and by getting your glasses and feet checked. Most importantly you can energize your body with exercise. By improving your strength, flexibility and balance you can significantly reduce your risk of a potentially serious fall.